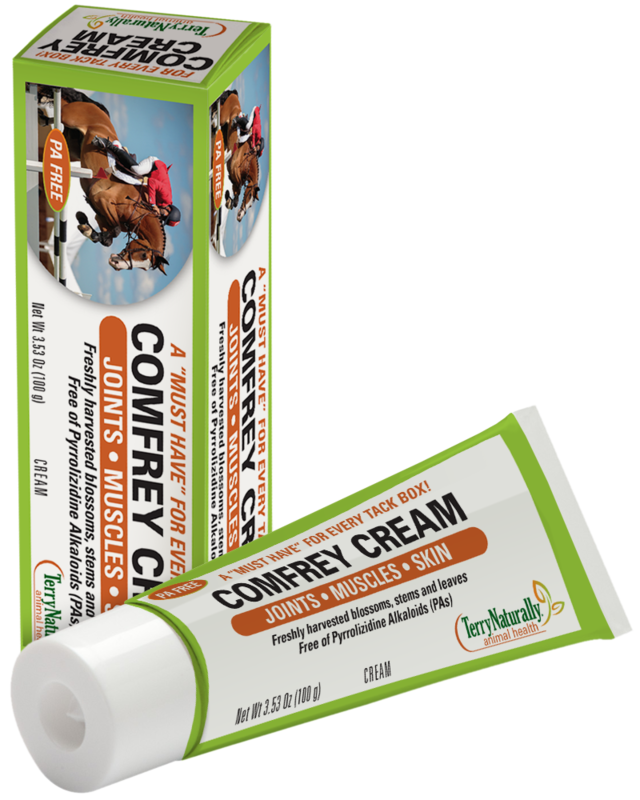 With your busy schedule, you can count on Comfrey Cream to absorb quickly. Use it as a liniment or as a poultice, whichever suits your horse’s need at the moment. The ancient "go-to" wisdom of this botanical is a welcome addition to your horse’s protocol as a prized performer. Purified Water, Glyceryl Stearate, Comfrey (Symphytum x uplandicum NYMAN) Extract naturally containing Choline, Rosmarinic Acid and Allantoin, PEG-20 Glyceryl Stearate, Isopropyl Myristate, Propylene Glycol, Octyldodecanol, Glycol Salicylate, Dimethicone, Sorbic Acid, Rosemary (Rosmarinus officinalis) Oil, Tocopheryl Acetate, Citric Acid. RECOMMENDATIONS: Apply liberally several times daily on cleansed area. For external use only. Avoid contact with eyes. Store at room temperature (68-77°F).